Huber Chiropractic P.C. concentrates on spinal correction to ensure a healthier way of life. Acupuncture is also utilized (when needed) to increase the speed and efficiency of the wellness process. 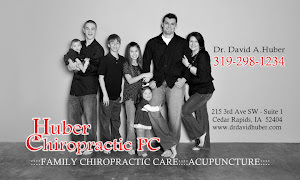 Huber Chiropractic PC • 319-298-1234 • Copyright © 2011 All rights reserved.